Declan Rice: Is West Ham midfielder ready for England? 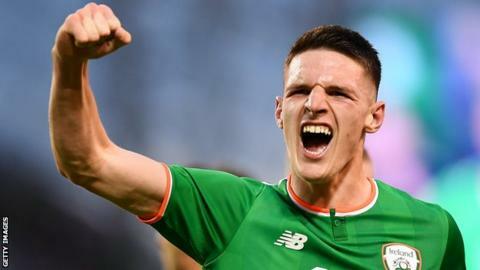 West Ham midfielder Declan Rice pledged his international future to England last week - a controversial move after he had already won three caps for the Republic of Ireland. Rice, 20, represented the Republic's senior side in three friendlies, having played for his grandparents' country since under-16 level. The London-born player has excelled this season in a defensive midfield role for the Hammers. So does his decision mean he is nailed on to be named in England manager Gareth Southgate's squad for next month's Euro 2020 qualifiers against the Czech Republic and Montenegro? Former internationals Lee Dixon, Chris Sutton, Karen Carney and John O'Shea - all speaking on BBC Radio 5 live's Monday Night Club - are split on whether Rice will be involved at the first opportunity. Ex-England and Arsenal right-back Dixon believes Rice, who has only made 59 appearances for West Ham, may need more time before stepping up to Southgate's squad. "I definitely think he is an asset for England," he said. "But it is the same thing with the media - as soon as plays three or four games and is playing well, we're throwing him in the England team and making him the best player in the world. "Let him develop on his own. Whether he is in this squad or not, it might be a bit too early for him." England winger Carney agrees Rice may need more time to develop, especially as he could find himself under increased attention from opposing teams as his reputation continues to grow. "He's only 20 but it has been a big season for him," said the Chelsea player, who has won 133 caps. "Everyone at West Ham was worried about losing Jack Wilshere to injury, then suddenly Rice has come in as an emerging talent and taken his opportunity by the scruff of the neck. "But people know about him now so he has to keep developing and evolving. He needs time to develop and we hope he will progress." Rice will be hoping to provide competition for Eric Dier and Jordan Henderson, who both played integral parts in England's run to the World Cup semi-finals last year, for a central-midfield role in Southgate's side. "He's a better player than Eric Dier. He's a better technician than Dier," said Sutton, who won one England cap in 1997 before falling out with manager Glenn Hoddle. "Ireland are not at England's level so we can't question his ambition for changing and going to England, but morally I can understand why many Ireland fans are angry." Former Manchester United defender O'Shea, who won 118 caps for the Republic, said Rice would have been a huge asset to Mick McCarthy's team. "I saw him involved with the Ireland squad and he looked the real deal - then England came calling and his mind was changed," said O'Shea, who played alongside Rice in his final international appearance. "He's a very good player - his temperament, attitude is top-class. "At the minute, he looks like he could get into England squad and improve it, but that could change very quickly. "You don't know what is around the corner, injuries, form, other English players coming through and the competition he could face."